Pancreaticoduodenectomy has evolved since Kausch performed the first successful procedure as a two-stage operation in 1912. He was preceded by Codivilla in Italy, who performed the first pancreaticoduodenectomy in the 1890s; however, the patient unfortunately died in the immediate postoperative period. The modern colloquial name for this operation (ie, Whipple procedure) refers to Dr Allen Oldfather Whipple, the surgeon who reported his series of pancreaticoduodenectomies in 1935. He had performed the procedure on three patients as a two-stage operation for periampullary neoplasms, then later refined his methodology to a one-stage procedure. In 1937, Brunschwig extended the indications for pancreaticoduodenectomy by performing the operation for pancreatic head lesions. 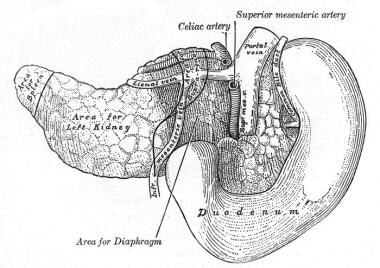 In 1946, Waugh and Clagett described a formal en-bloc resection of the gallbladder with the common bile duct (CBD), gastric antrum, duodenum, and pancreatic head performed as a one-stage procedure, which we recognize today as the classic pancreaticoduodenectomy. However, the operation, though refined since Codivilla and Kausch, was utilized sparingly; perioperative mortality continued to be prohibitive, estimated as being close to 25% into the 1960s. Although innumerable details of pancreaticoduodenectomy yield to continued innovation, a comprehensive discussion of intraoperative variants (ie, duct to mucosa vs invagination of the pancreaticojejunal anastomosis, diverse approaches to vein reconstructions, nuances of each enteric anastomosis, and modifications of Roux-en-Y reconstructions, to name a few) is beyond the scope of this article. We will focus on the technical aspects and perioperative impacts of the Traverso modification. See also Ampullary Carcinoma, Pancreatic Cancer, Pancreatic Trauma, and Carcinoma of the Ampulla of Vater. Resectability is best described as the absence of contraindications to resection (see Technical Considerations). Computed tomography (CT) with thin collimation will detect anatomic contraindications to surgical resection. The pancreas is prismoid in shape and appears triangular in cut section, with superior, inferior, and anterior borders as well as anterosuperior, anteroinferior, and posterior surfaces. The head of the pancreas lies in the duodenal C loop in front of the inferior vena cava (IVC) and the left renal vein (see the images below). The uncinate process is an extension of the lower (inferior) half of the head toward the left; it is of varying size and is wedged between the superior mesenteric vessels (vein on the right, artery on the left) in front and the aorta behind it. 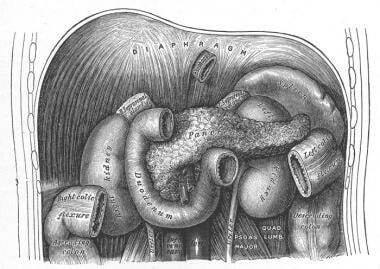 Pancreas and duodenum, posterior view. For more information about the relevant anatomy, see Pancreas Anatomy. See Pancreatic Adenocarcinoma Imaging: What You Need to Know, a Critical Images slideshow, to help identify which imaging studies to use to identify and evaluate this disease. Head-to-head comparison between the classically described pancreaticoduodenectomy and PPPD has not detected any significant differences with regard to operating time, perioperative morbidity, perioperative mortality, and long-term survival at 1, 3, and 5 years. Operative blood loss is slightly lower with PPPD, but the clinical significance of this is not clear. Patients who undergo PPPD have a much higher incidence of DGE than those who undergo classic pancreaticoduodenectomy. This is the primary morbidity with PPPD patients, leading to more medical interventions and thus increased cost postoperatively, related to hospital stay, cost of jejunal feedings, and jejunal tube maintenance (eg, home nursing for tube care, emergency department [ED] visits for dislodgment, and tube replacement for dysfunction). If aspiration then complicates the matter, there can be a threat to the patient's life as well. From an oncologic perspective, PPPD should not be performed with large, bulky tumors or with any tumor that may involve the first or second portion of the duodenum. In addition, with the gastric antrectomy performed in classic pancreaticoduodenectomy, an average of four more nodes are harvested than would be with PPPD. These will be positive for nodal metastases approximately 5% of the time. The question therefore arises as to whether the incidence of non-R0 resection in this small cadre of patients should bias the surgeon against PPPD. In view of the aforementioned considerations and the lack of statistical difference with regard to patient morbidity, mortality, and survival after classic pancreaticoduodenectomy and the pylorus-preserving modification, the individual patient profile and specific tumor characteristics should weight the surgeon’s choice of approach. Tumor resectability must be assessed well before the patient arrives at the operating room. The tumor is considered resectable if it is locally confined (ie, if there is no distant disease). Preoperative imaging studies are the cornerstone of evaluation. As noted, CT with thin collimation is the most effective tool for identifying local extension. The tumor can be evaluated in relation to important vascular structures. A fat plane should be seen between the low-density tumor and surrounding structures. Additional imaging is usually not necessary, but in certain cases, endoscopic ultrasonography (EUS), fine-needle aspiration (FNA), or both may be employed for tissue diagnosis before the initiation of neoadjuvant therapy. A 2014 Cochrane review examined six randomized controlled trials (RCTs) comparing classic Whipple pancreaticoduodenectomy with PPPD in a total of 465 patients with periampullary or pancreatic carcinoma. The authors found no relevant differences in mortality, morbidity, or survival between the two operations. This review was updated in 2016 to include eight RCTs with a total of 512 participants. Again, the investigators found no evidence of any relevant differences in mortality, morbidity, and survival between the two operations, though some perioperative outcome measures favored PPPD to a significant degree. Nakeeb A, Lillemoe KD, Cameron JL. Procedures for benign and malignant pancreatic disease. Souba WW, Fink MP, Jurkovich GJ, Kaiser LR, Pearce WH, Permberton JH, et al, eds. ACS Surgery: Principles and Practice. 6th ed. New York: WebMD; 2007. 785-97. Denbo JW, Kim MP, Katz MHG. Pancreatic ductal adenocarcinoma. Feig BW, Ching CD, eds. The MD Anderson Surgical Oncology Handbook. 6th ed. Philadelphia: Wolters Kluwer; 2019. Chap 14. He J, Cameron JL. Pancreaticoduodenectomy for pancreatic cancer, short- and long-term outcomes after Kausch-Whipple and pylorus-preserving resection. Beger HG, Warshaw AL, Hruban RH, Buechler MW, Lerch MM, Neoptolemos JP, et al, eds. The Pancreas: An Integrated Textbook of Basic Science, Medicine, and Surgery. 3rd ed. Hoboken, NJ: Wiley-Blackwell; 2018. 783-9. Yen TWF, Evans DB. Resection for neoplasms of the pancreas (proximal resection). Clavien PA, Sarr MG, Fong Y, eds. Atlas of Upper Gastrointestinal and Hepato-Pancreato-Biliary Surgery. Berlin: Springer-Verlag; 2007. 763-80. Wang M, Zhang H, Wu Z, Zhang Z, Peng B. Laparoscopic pancreaticoduodenectomy: single-surgeon experience. Surg Endosc. 2015 Dec. 29 (12):3783-94. [Medline]. Parisi A, Desiderio J, Trastulli S, Cirocchi R, Renzi C, Boselli C, et al. Robotic pylorus-preserving pancreaticoduodenectomy: Technical considerations. Int J Surg. 2015 Sep. 21 Suppl 1:S59-63. [Medline]. Molina DC, Lambreton F, Majul RA. Trends in Robotic Pancreaticoduodenectomy and Distal Pancreatectomy. J Laparoendosc Adv Surg Tech A. 2018 Sep 14. [Medline]. Diener MK, Fitzmaurice C, Schwarzer G, Seiler CM, Hüttner FJ, Antes G, et al. Pylorus-preserving pancreaticoduodenectomy (pp Whipple) versus pancreaticoduodenectomy (classic Whipple) for surgical treatment of periampullary and pancreatic carcinoma. Cochrane Database Syst Rev. 2014 Nov 11. 11:CD006053. [Medline]. Hüttner FJ, Fitzmaurice C, Schwarzer G, Seiler CM, Antes G, Büchler MW, et al. Pylorus-preserving pancreaticoduodenectomy (pp Whipple) versus pancreaticoduodenectomy (classic Whipple) for surgical treatment of periampullary and pancreatic carcinoma. Cochrane Database Syst Rev. 2016 Feb 16. 2:CD006053. [Medline]. Hanna MM, Tamariz L, Gadde R, Allen C, Sleeman D, Livingstone A, et al. Delayed gastric emptying after pylorus preserving pancreaticoduodenectomy--does gastrointestinal reconstruction technique matter?. Am J Surg. 2016 Apr. 211 (4):810-9. [Medline]. Qian D, Lu Z, Jackson R, Wu J, Liu X, Cai B, et al. Effect of antecolic or retrocolic route of gastroenteric anastomosis on delayed gastric emptying after pancreaticoduodenectomy: A meta-analysis of randomized controlled trials. Pancreatology. 2016 Jan-Feb. 16 (1):142-50. [Medline]. Joliat GR, Labgaa I, Demartines N, Schäfer M, Allemann P. Effect of Antecolic versus Retrocolic Gastroenteric Reconstruction after Pancreaticoduodenectomy on Delayed Gastric Emptying: A Meta-Analysis of Six Randomized Controlled Trials. Dig Surg. 2016. 33 (1):15-25. [Medline]. Gupta R, Darby GC, Imagawa DK. Efficacy of Negative Pressure Wound Treatment in Preventing Surgical Site Infections after Whipple Procedures. Am Surg. 2017 Oct 1. 83 (10):1166-1169. [Medline]. Hanna MM, Gadde R, Allen CJ, Meizoso JP, Sleeman D, Livingstone AS, et al. Delayed gastric emptying after pancreaticoduodenectomy. J Surg Res. 2016 May 15. 202 (2):380-8. [Medline]. Mohammed S, Van Buren Ii G, McElhany A, Silberfein EJ, Fisher WE. Delayed gastric emptying following pancreaticoduodenectomy: Incidence, risk factors, and healthcare utilization. World J Gastrointest Surg. 2017 Mar 27. 9 (3):73-81. [Medline]. [Full Text]. Liang X, Shi LG, Hao J, Liu AA, Chen DL, Hu XG, et al. Risk factors and managements of hemorrhage associated with pancreatic fistula after pancreaticoduodenectomy. Hepatobiliary Pancreat Dis Int. 2017 Oct 15. 16 (5):537-544. [Medline]. Pylorus-preserving pancreaticoduodenectomy (Whipple procedure). Procedure performed by John Chabot, MD, Columbia University Medical Center, New York, NY. Video courtesy of ColumbiaDoctors (https://www.columbiadoctors.org).